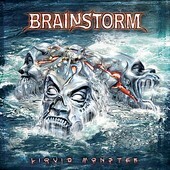 German power metal troupe Brainstorm barrel down the gates on the quintet's latest offering, the 11-track LIQUID MONSTER, Fusing triumphant choruses with exhilarating guitar runs and interlocking rhythms, tracks like "Mask of Life" and "Lifeline" will summon up the metal from deep inside your soul. Falling somewhere in between vintage Queensryche, Helloween, and Iced Earth, Brainstorm's searing hooks are both heavy and catchy, while the band's overall flurry of metal is overwhelming to the casual fan, but will undoubtedly please those that revel in Priest, Maiden, Dio, and the like. If you yearn for the days when falsetto metal voices were king and the riffs came fast and furious, Brainstorm has the remedy you crave.